Otto Warmbier was arrested last year on charges of theft as he attempted to leave North Korea after traveling there with a tour group. His recent release from North Korea after 15 months of detainment was followed by his death in the US. 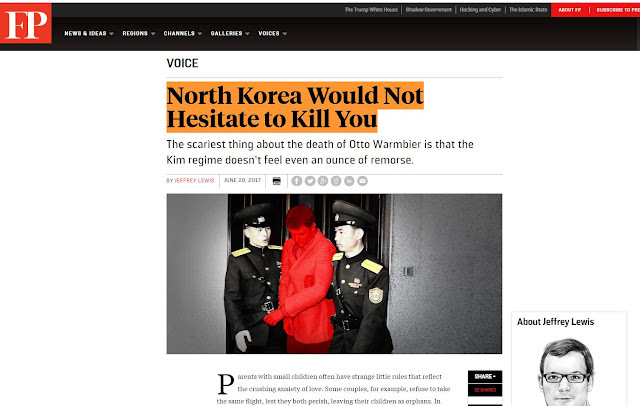 A firestorm of accusations, condemnation, and angry threats have resonated across the Western media, with op-eds ranging from the Independent’s, “America needs to do something about Otto Warmbier’s death – but military force against North Korea isn’t an option,” which calls on US foreign policy to follow that of Imperial Rome’s, including swift and severe retribution, to the Australian’s, “What did North Korea do to Otto Warmbier?,” which incoherently leaps from commenting on Warmbier’s “beautiful name” to claiming, “he was a pawn, a victim of the maniacal brutality of Kim Jong-un,” to Foreign Policy’s piece in which the title, “North Korea Would Not Hesitate to Kill You,” says it all. Nowhere amongst this familiar Western propaganda used worldwide to dehumanize nations and prime the public for unending hostilities can any actual evidence be found that the North Korean government killed Otto Warmbier. In every article it is noted that he was returned to the US, and that it was in the US where he died. His death, however, is being blamed on his alleged mistreatment while in North Korea. The family of a US student who died shortly after being freed from North Korea have declined a post-mortem examination, according to a US coroner. Otto Warmbier died on Monday near his family home in Ohio after more than 15 months in North Korean captivity. The Hamilton County coroner said only an external exam was performed on the 22-year-old. No conclusions about the cause and manner of Mr Warmbier’s death have been drawn at this time. However, without an autopsy, whatever the perception is surrounding North Korea – no conclusions can honestly be drawn one way or the other regarding Warmbier’s death. One conclusion that can be drawn without doubt, however – is the shameless, merciless, and inhumane manner in which the Western media has exploited the death of Otto Warmbier. Without evidence and no prospect of ever obtaining any, the Western media has rushed to create as much anger, hysteria, and resentment as possible in the minds of the Western public before the next news cycle hits. 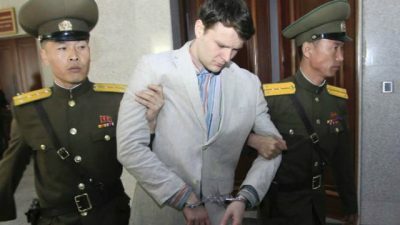 Embedded in the minds of many across the West will be the notion that North Korea “killed” Otto Warmbier. The minds of many will be primed ahead of further escalations by Washington on the Korean Peninsula where it seeks to maintain its power and influence as part of a wider strategy to maintain its unwarranted and uninvited “primacy” across Asia. While the Western media poses as appalled over North Korea’s inhumanity, it is the Western media that has helped set the stage for yet another bloody chapter of US-Asia relations and all of the inhumanity that unfolds because of it.